Wonderfully warm in marmalade fur, Bashful Saffron Bunny's a treasure. 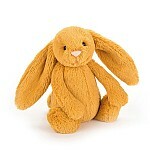 This lopsy lovely is cinnamon-sweet, with soft, spicy fur and scrumptious ears. She loves to help cook, and her perky nose will help to tell when everything's done to perfection!